The Release Notes include information concerning the release of a new Magic: The Gathering set, as well as a collection of clarifications and rulings involving that set's cards. It's intended to make playing with the new cards more fun by clearing up the common misconceptions and confusion inevitably caused by new mechanics and interactions. As future sets are released, updates to the Magic rules may cause some of this information to become outdated. If you can't find the answer you're looking for here, please contact us at Wizards.CustHelp.com. The Magic: The Gathering—Commander (2018 Edition) release consists of four different game packs. Each game pack contains a deck with 100 cards plus an oversized foil commander card. The four decks are "Adaptive Enchantment," "Exquisite Invention," "Nature's Vengeance," and "Subjective Reality." There are 59 cards within the Magic: The Gathering—Commander (2018 Edition) decks that are completely new to the Magic game. These cards are legal for play in the Commander, Vintage, and Legacy formats. They aren't legal for play in the Standard, Modern, or Brawl formats. The other cards in this release are legal for play in any format that already allows those cards. That is, appearing in this release doesn't change a card's legality in any format. For more information about Magic formats, please visit Magic.Wizards.com/Rules. For information about the format legality of a specific card, please visit Gatherer.Wizards.com, search for the card, and check the "Sets & Legality" tab. Created and popularized by fans, Commander is a casual format in which each player's deck is led by that player's commander—traditionally a legendary creature, although this release introduces four planeswalker cards that can also be a deck's commander. It's usually played in casual Free-for-All multiplayer games, although two-player games are also popular. Each player starts at 40 life. Each deck contains exactly 100 cards, including its commander. 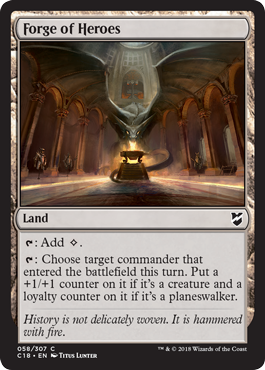 Commander is also a "singleton" format: other than basic lands, each card must have a different English name. A recommended banned list for the Commander format is maintained by the rules committee at MTGCommander.net, not by Wizards of the Coast. The legendary card chosen as your deck's commander plays a prominent role in games, often appearing on the battlefield multiple times. For ease of reading, this document will generally assume that your commander is a creature card, but a very small number of legendary planeswalker cards have the text "[This card] can be your commander." The same rules referenced here apply to those cards if one of them is your commander. A legendary noncreature card can't be chosen as your deck's commander unless it has that ability. Your commander begins the game in a separate game area called the command zone. The other 99 cards are shuffled and become your library. While in the command zone, your commander's abilities won't affect the game unless those abilities specifically say they do. You may cast your commander from the command zone. Each time you do, it costs 2 more to cast for each time you've previously cast it from the command zone during the game. This additional cost is informally known as the "commander tax." 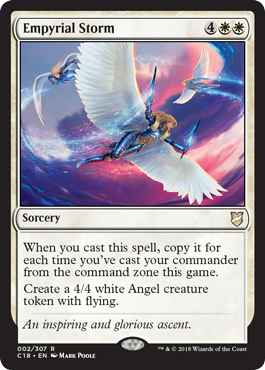 If you're casting your commander for an alternative cost, such as "without paying its mana cost" or a bestow cost, the commander tax applies in addition to that alternative cost. 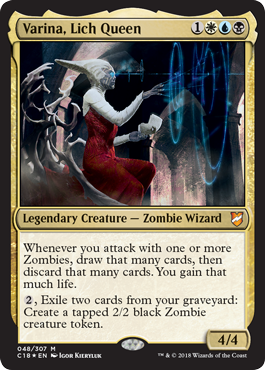 If your commander would be exiled or put into your hand, graveyard, or library from anywhere, you may choose to put it into the command zone instead. Your commander's color identity determines the other cards that can be in your deck. A card's color identity includes its color, as defined by its mana cost or color indicator, plus the colors of any colored mana symbols in the rules text. Color identity is established before the game begins and doesn't change during the game, even if your commander becomes a different color. 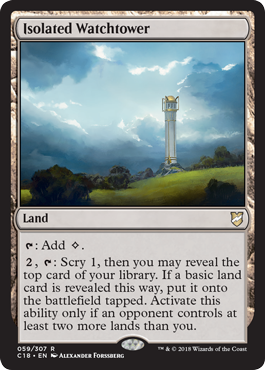 A land with a basic land type can't be included in your deck if that basic land type's intrinsic mana ability generates a color of mana outside of your color identity. Color words in a card's text don't add to a card's color identity. 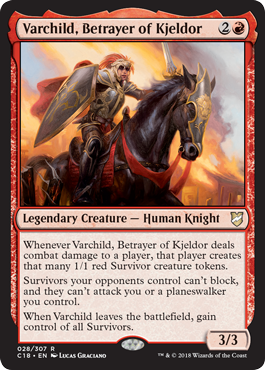 In addition to the normal rules regarding winning and losing the game, the Commander format has one other rule: a player who has been dealt 21 or more combat damage by the same commander over the course of the game loses the game. Players should keep track of combat damage dealt to them by each commander over the course of the game. This rule includes a player's own commander, which can deal combat damage to its owner if the commander is controlled by another player or if its combat damage gets redirected to that player. Unlike two-player games, multiplayer games can continue after a player loses and leaves the game. When a player leaves the game, all permanents, spells, and other cards owned by that player also leave the game. If that player controlled any abilities or copies of spells that were waiting to resolve, they cease to exist. If that player controlled any permanents owned by another player, the effects that gave control of them to the player who left end. If this doesn't give control of them to a different player (perhaps because they entered the battlefield under the control of the player who left), they're exiled. Each Magic: The Gathering—Commander (2018 Edition) deck comes with an oversized premium card that corresponds to one possible commander of that deck. This card is for fun only and isn't required for Commander gameplay. You must have the traditional Magic card version of your commander, even if you use the oversized card. 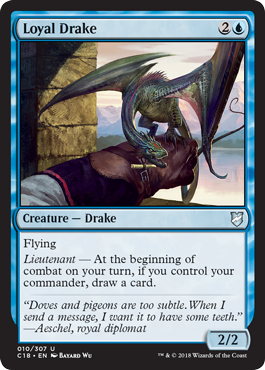 As long as your commander is in a public zone, such as the command zone or the battlefield, you may substitute the oversized card for the traditional Magic card. If your commander is in a hidden zone, such as your library or your hand, use the traditional Magic card. Each mechanic that appears in this release has appeared in previous sets. The following mechanics appear on new cards appearing in Magic: The Gathering—Commander (2018 Edition) decks. The rules for these mechanics haven't changed from their most recent previous appearance. 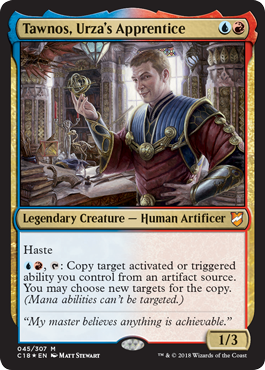 Lieutenant is an ability word that appears in italics on a cycle of creatures that become more powerful if you control your commander. (An ability word has no rules meaning.) Cards with lieutenant abilities in the Magic: The Gathering—Commander (2014 Edition) set got bigger and better as long as you had your commander—in this set, they benefit you each turn while you have your commander. If you don't control your commander as the lieutenant ability resolves, you won't get its effect. The lieutenant effect happens only once each combat, even if you somehow control multiple commanders (perhaps because you have two commanders with a partner ability from the Battlebond set). If you have multiple commanders, you need to control only one for the lieutenant effect to happen. 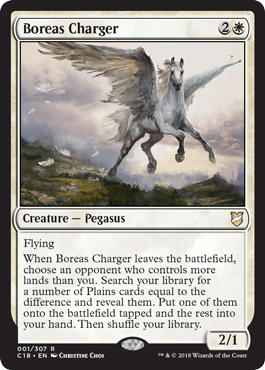 Originally appearing in the Theros set, the bestow mechanic lets you cast certain creatures as Auras, giving them a chance to boost another creature before they serve as creatures themselves. 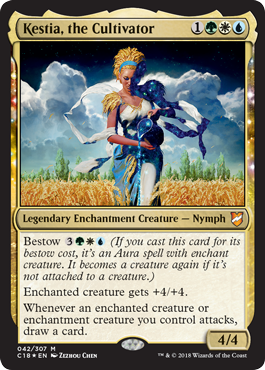 Bestow is an alternative cost to cast the spell with bestow. It can't be combined with other alternative costs, such as casting a spell "without paying its mana cost." To determine the total cost of a spell, start with the mana cost or alternative cost (such as a bestow cost) you're paying, add any cost increases, then apply any cost reductions. The converted mana cost of the spell remains unchanged, no matter what the total cost to cast it was. A spell with bestow is either a creature spell or an Aura spell. It's never both. Similarly, a permanent with bestow is either a creature or an Aura, but not both. Unlike other Aura spells, an Aura spell with bestow still resolves if its target is illegal. Instead of entering the battlefield as an Aura, the effect making it an Aura spell ends, it loses enchant creature, and it resolves and enters the battlefield as an enchantment creature. Unlike other Auras, an Aura with bestow isn't put into its owner's graveyard if the enchanted creature leaves the battlefield or becomes an illegal creature for the Aura to enchant. Rather, the effect making it an Aura ends, it loses enchant creature, and it remains on the battlefield as an enchantment creature. It can attack (and its abilities can be activated, if it has any) on the turn it becomes unattached if it's been under your control continuously, even as an Aura, since your most recent turn began. If a permanent with bestow enters the battlefield by any method other than being cast, it will be an enchantment creature. You can't choose to pay the bestow cost and have it become an Aura. Auras attached to a creature don't become tapped when the creature becomes tapped. Except in some rare cases, an Aura with bestow remains untapped when it becomes unattached and becomes a creature. Creatures with the evoke keyword, first featured in the Lorwyn set, have an effect either when they enter the battlefield or when they leave the battlefield. By casting them for their evoke cost, you can get that effect right away instead of keeping the creature. 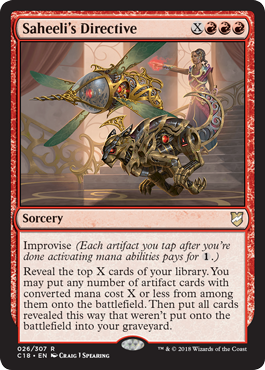 The improvise keyword from the Aether Revolt set lets you put every one of your artifacts to good use—you can pay for spells that have improvise by using your artifacts. Reveal the top X cards of your library. You may put any number of artifact cards with converted mana cost X or less from among them onto the battlefield. Then put all cards revealed this way that weren't put onto the battlefield into your graveyard. Improvise can't pay for W, U, B, R, G, or C mana symbols in a spell's total cost. Improvise can't be used to pay for anything other than the cost of casting the spell. For example, it can't be used during the resolution of an ability that says "Counter target spell unless its controller pays 3." If an artifact you control has a mana ability with T in the cost, activating that ability while casting a spell with improvise will result in the artifact being tapped when you pay the spell's costs. You won't be able to tap it again for improvise. Similarly, if you sacrifice an artifact to activate a mana ability while casting a spell with improvise, that artifact won't be on the battlefield when you pay the spell's costs, so you won't be able to tap it for improvise. When using improvise to cast a spell with X in its mana cost, first choose the value for X. That choice, plus any cost increases or decreases, will determine the spell's total cost. Then you can tap artifacts you control to help pay that cost. For example, if you cast Saheeli's Directive and choose X to be 3, the total cost is 3RRR. If you tap two artifacts, you'll have to pay 1RRR. The Fate Reforged set brought us 2/2 colorless creatures whose identities were concealed by being manifested face down. The manifest mechanic returns in this set to keep your opponents guessing. The face-down permanent is a 2/2 creature with no name, mana cost, creature types, or abilities. It's colorless and has a converted mana cost of 0. Other effects that apply to the permanent can still grant or change any of these characteristics. The face-down characteristics of a permanent are copiable values. If another object becomes a copy of a face-down creature or if a token is created that's a copy of a face-down creature, that new object is a 2/2 colorless face-up creature with no abilities. Any time you have priority, you may turn a manifested creature face up by revealing that it's a creature card (ignoring any type-changing effects that might be applying to it) and paying its mana cost. This is a special action. It doesn't use the stack and can't be responded to. Because face-down creatures don't have a name, they can't have the same name as any other creature or share any creature types with any other creature, even another face-down creature. Because the permanent is on the battlefield both before and after it's turned face up, turning a permanent face up doesn't cause any enters-the-battlefield abilities to trigger. A permanent that turns face up or face down changes characteristics but is otherwise the same permanent. Spells and abilities that were targeting that permanent, as well as Auras and Equipment that were attached to the permanent, aren't affected. Turning a permanent face up or face down doesn't change whether that permanent is tapped or untapped. At any time, you can look at a face-down permanent you control. You can't look at face-down permanents you don't control unless an effect instructs you to do so. If a face-down permanent you control leaves the battlefield, you must reveal it. You must also reveal all face-down spells and permanents you control if you leave the game or if the game ends. You must ensure that your face-down spells and permanents can easily be differentiated from each other. You're not allowed to mix up the cards that represent them on the battlefield to confuse other players. The order they entered the battlefield should remain clear. Common methods for indicating this include using markers or dice, or simply placing them in order on the battlefield. You must also track how each became face down (manifested, cast face down using a morph ability, and so on). There are no cards in this set that would turn a face-down instant or sorcery card on the battlefield face up, but some older cards can try to do this. If something tries to turn a face-down instant or sorcery card on the battlefield face up, reveal that card to show all players it's an instant or sorcery card. The permanent remains on the battlefield face down. Abilities that trigger when a permanent turns face up won't trigger, because even though you revealed the card, it never turned face up. If an effect tries to return a face-down creature to the battlefield after it leaves (such as Aminatou's second ability or Adarkar Valkyrie's delayed triggered ability), that effect returns the card face up. If it tries to put an instant or sorcery card onto the battlefield this way, that card remains in its current zone instead. Some previous Magic sets feature double-faced cards, which have a Magic card face on each side rather than a Magic card face on one side and a Magic card back on the other. If a double-faced card is manifested, it will be put onto the battlefield face down. While face down, it can't transform. If the front face of the card is a creature card, you can turn it face up by paying its mana cost. If you do, its front face will be up. Although a double-faced card can enter the battlefield face down, one already on the battlefield can't be turned face down. The Avacyn Restored set taught us that a well-timed miracle can turn the tide of battle. The miracle keyword lets you cast a spell with a tremendous discount if it's your first draw for a turn and you cast it right away. Cards with miracle feature a modified frame to immediately let you know that you've drawn one. It's important to reveal a card with miracle before it is mixed with the other cards in your hand. You can reveal and cast a card with miracle on any turn, not just your own, if it's the first card you've drawn that turn. Multiple card draws are always treated as a sequence of individual card draws. For example, if you haven't drawn any cards yet during a turn and cast a spell that instructs you to draw three cards, you'll draw them one at a time. Only the first card drawn this way may be revealed and cast using its miracle ability. If an effect puts a card into your hand without using the word "draw," the card wasn't drawn. You don't have to reveal a drawn card with miracle if you don't wish to cast it at that time. You can cast a card for its miracle cost only as the miracle triggered ability resolves. If you don't want to cast it at that time (or you can't cast it, perhaps because there are no legal targets available), you won't be able to cast it later for the miracle cost. You cast the card with miracle during the resolution of the triggered ability. Ignore any timing rules based on the card's type. Miracle is an alternative cost to cast the spell with miracle. It can't be combined with other alternative costs, such as casting a spell "without paying its mana cost." To determine the total cost of a spell, start with the mana cost or alternative cost (such as a miracle cost) you're paying, add any cost increases, then apply any cost reductions. The converted mana cost of the spell remains unchanged, no matter what the total cost to cast it was. If the card with miracle leaves your hand before the triggered ability resolves, you won't be able to cast it using its miracle ability. You still draw the card, whether you use the miracle ability or not. Any ability that triggers whenever you draw a card, for example, will trigger. If you don't cast the card using its miracle ability, it will remain in your hand. If you want to cast the same spell over and over, the Eventide set provides the retrace keyword to help. You just need to add a land card when you cast it to keep the fun going from your graveyard. Put target permanent you own on the bottom of your library. Reveal cards from the top of your library until you reveal a card that shares a card type with that permanent. Put that card onto the battlefield and the rest on the bottom of your library in a random order. 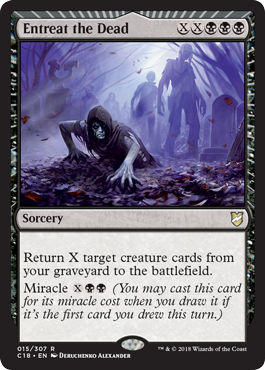 Casting a card by using its retrace ability works just like casting any other spell, with two exceptions: You're casting it from your graveyard rather than your hand, and you must discard a land card in addition to any other costs. Casting a card with retrace from your graveyard follows the normal timing rules for its card type. When a retrace card you cast from your graveyard resolves or is countered, it's put back into your graveyard. You may use the retrace ability to cast it again. If it's your turn, you may do so before any other player may take actions to try to remove it from your graveyard. Enchanted creature has base power and toughness 8/8 and has "Whenever this creature attacks, you may tap target creature with power 8 or less." Totem armor's effect is applied no matter why the enchanted permanent would be destroyed: because it's been dealt lethal damage, or because it's being affected by an effect that says to "destroy" it (such as Putrefy). In either case, all damage is removed from the permanent and the Aura is destroyed instead. If a permanent you control is enchanted with multiple Auras that have totem armor, and the enchanted permanent would be destroyed, one of those Auras is destroyed instead — but only one of them. You choose which one because you control the enchanted permanent. Totem armor has no effect if the enchanted permanent is put into a graveyard for any other reason, such as if it's sacrificed, if the "legend rule" applies to it, or if its toughness is 0 or less. Five cards in this set reward you for casting your commander by multiplying their effect for each time you've done so. Each Storm's triggered ability counts only how many times you've cast your commander from the command zone before that triggered ability resolves. If you cast your commander again later, you won't get another copy. If your commander was countered, that time you cast it still counts. Each Storm's triggered ability can copy the Storm spell even if that spell is countered before that ability resolves. The copies are created on the stack, so they're not "cast." Abilities that trigger when a player casts a spell (such as the Storm's ability itself) won't trigger. You draw a card and put one back all while Aminatou's first ability is resolving. Nothing can happen between the two, and no player may choose to take actions. Aminatou's second ability can target any permanent you own, including those another player controls. Once the exiled permanent returns, it's considered a new object with no relation to the object that it was. Auras attached to the exiled permanent will be put into their owners' graveyards. Equipment attached to the exiled permanent will become unattached and remain on the battlefield. Any counters on the exiled permanent will cease to exist. As Aminatou's third ability resolves, you choose a direction, then each player takes control of their new permanents at the same time. The effect of Aminatou's third ability lasts indefinitely. It continues to apply after Aminatou (or her controller) leaves the game. In a two-player game, each player gains control of each permanent the other controls (aside from Aminatou) no matter which direction you choose. In a multiplayer game, if a player leaves the game, all cards that player owns leave as well. 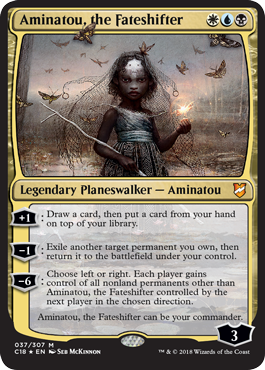 The effect of Aminatou's third ability stops applying to all permanents that player controlled and control of them reverts to their previous controller. If you wish to put a land card onto the battlefield, you do so while Aminatou's Augury is resolving, before you're allowed to cast any of the other cards. You may do this even if you've already played a land this turn. If a nonland card has multiple types, such as an artifact creature, you may cast it as either of those types. For example, you could cast one artifact creature as your artifact card and another artifact creature as your creature card. If you exile a land with another card type, you can't play it later in the turn. You can only put it onto the battlefield at the time Aminatou's Augury instructs you to. You must follow the normal timing permissions and restrictions of each spell you cast. If you cast a card "without paying its mana cost," you can't choose to cast it for any alternative costs, such as evoke costs. You can, however, pay additional costs. If the card has any mandatory additional costs, such as that of Tormenting Voice, those must be paid to cast the card. This spell costs 1 less to cast for each attacking creature. Ancient Stone Idol's cost is reduced for each attacking creature, not just creatures attacking you. It even counts your attacking creatures. If there are enough attacking creatures, Ancient Stone Idol's cost can be reduced to 0. The total cost to cast a spell is locked in before you pay that cost. 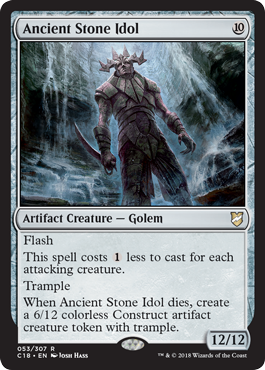 For example, if you control five attacking creatures, including one you can sacrifice to add C to your mana pool, Ancient Stone Idol costs 5 to cast. Then you can sacrifice the creature when you activate mana abilities just before paying the cost, and it still costs only 5 to cast. Arixmethes can't be played as a land. Arixmethes isn't a land until after it has entered the battlefield. Effects such as that of Blood Moon won't affect its enters-the-battlefield ability. 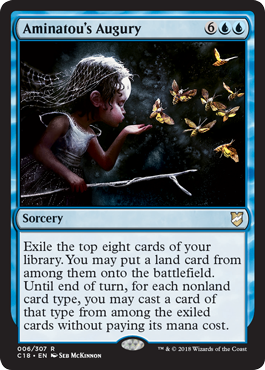 Similarly, replacement effects that modify how creatures you control enter the battlefield will see Arixmethes entering as a creature rather than a land. However, triggered abilities (such as landfall abilities) will see that a land entered the battlefield and not a creature. Arixmethes can tap for mana the turn it enters the battlefield as long as it has slumber counters on it. If you can figure out how to untap it, that is. Arixmethes's effect causing it to be a land overwrites any earlier effects that gave it additional types. For example, a Phyrexian Metamorph that copies Arixmethes will be a land, not an artifact land, until its slumber counters are removed. Arixmethes's triggered ability resolves before the spell that causes it to trigger, but after targets have been chosen for that spell. It resolves even if that spell is countered. Once Arixmethes is a creature again, it can attack on the same turn as long as you've controlled it since your most recent turn began. 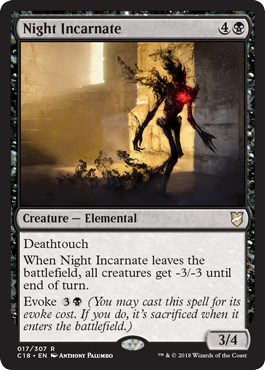 If enough -1/-1 counters are put on Bloodtracker at the same time to make its toughness 0 or less, the number of +1/+1 counters on it before it got any -1/-1 counters will be used to determine how many cards you draw. 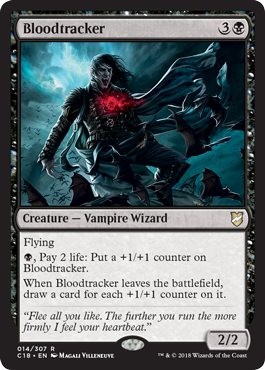 For example, if there are three +1/+1 counters on Bloodtracker and it gets six -1/-1 counters, you'll draw three cards. That's because Bloodtracker's triggered ability checks the creature's existence just before it leaves the battlefield, and it still has all those counters on it at that point. You can find fewer Plains cards than the difference, perhaps because you don't have that many Plains cards left in your library. If no opponent controls more lands than you, you'll search your library and shuffle it, but you won't be able to find any Plains cards. The last effect of Brudiclad's triggered ability affects all tokens you control other than the chosen token, including the token that was just created if that isn't the chosen token. All other tokens you control become a copy of the chosen token, even those that aren't of the same type. For example, if you control a Treasure artifact token and choose the Myr token Brudiclad just created, your Treasure will become a copy of the Myr. The effect of Brudiclad's triggered ability lasts indefinitely. It continues to apply after Brudiclad leaves the game. Brudiclad copies only the values defined as the original token was created (unless that token is copying something else; see below). It doesn't copy whether that token is tapped or untapped, whether it as any counters on it or any Auras and Equipment attached to it, or any non-copy effects that have changed its power, toughness, types, color, or so on. If the chosen token is copying something else (for example, if the chosen token was previously affected by Brudiclad's triggered ability), then your tokens become copies of whatever the chosen token copied. 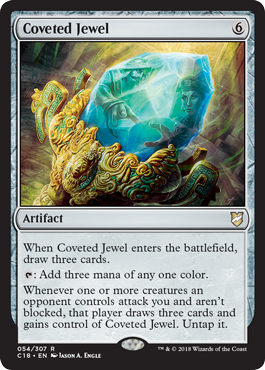 A creature attacking a planeswalker you control won't cause Coveted Jewel's last ability to trigger. Coveted Jewel's last ability triggers after you declare blockers (or declare no blockers at all) if any attacking creatures are unblocked. It doesn't matter if some attacking creatures were blocked. Coveted Jewel's last ability resolves after blockers are chosen but before combat damage is dealt. If more than one opponent attacks you at the same time, Coveted Jewel's last ability triggers for each of them. You choose which player ends up with Coveted Jewel, but each of them draws three cards and has a chance to activate its mana ability. Each copy resolves one at a time. Any abilities that trigger on the artifact token entering the battlefield resolve before the next copy resolves. The original spell is the last to resolve. The token copies exactly what was printed on the original artifact and nothing else (unless that artifact is copying something else or is a token; see below). It doesn't copy whether that artifact is tapped or untapped, whether it has any counters on it or Auras attached to it, or any non-copy effects that have changed its types, color, or so on. If the copied artifact has X in its mana cost, X is considered to be 0. If the copied artifact is a token, the token that's created copies the original characteristics of that token as stated by the effect that created the token. If the copied artifact is copying something else (for example, if the copied artifact is a Sculpting Steel), then the token enters the battlefield as whatever that artifact copied. Any enters-the-battlefield abilities of the copied artifact will trigger when the token enters the battlefield. Any "as [this artifact] enters the battlefield" or "[this artifact] enters the battlefield with" abilities of the chosen artifact will also work. There are several ways to secretly choose an opponent, including writing that player's name on a piece of paper that's kept with Emissary of Grudges. If you have more than one Emissary of Grudges, you may choose a different opponent for each one. Be careful to keep track of which opponent is chosen for each Emissary of Grudges. If Emissary of Grudges leaves the battlefield and returns, it's considered a new object. You may choose a new opponent and you may activate its last ability again. If you didn't choose an opponent when Emissary of Grudges entered the battlefield, you can't pay the cost to activate its last ability. 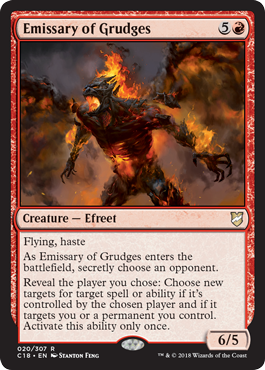 This will usually happen because you gained control of another player's Emissary of Grudges or because a creature already on the battlefield became a copy of Emissary of Grudges. The activated ability of Emissary of Grudges can affect a spell or ability that has multiple targets, even if some of those targets aren't you or permanents you control. You can choose new targets as long as at least one of those targets is you or a permanent you control. If there are no other enchantments on the battlefield, the triggered ability of Enchanter's Bane must target Enchanter's Bane. +2: Untap each enchanted permanent you control. −1: Create a white Aura enchantment token named Mask attached to another target permanent. The token has enchant permanent and totem armor. −7: Put the top seven cards of your library into your graveyard. Return all non-Aura enchantment cards from your graveyard to the battlefield, then do the same for Aura cards. An enchanted permanent is one with an Aura attached to it. Enchantment permanents you control that don't have Auras attached to them aren't enchanted. If an Aura with totem armor is itself enchanted by another Aura with totem armor, destroying either the first Aura or the permanent it enchants will result in only the second Aura being destroyed instead. Estrid's second ability might target a permanent that can't have the Aura token attached to it. In this case, the token isn't created at all. Estrid's second ability can't target Estrid, but the Mask token may legally enchant Estrid if you find a way to move it onto her. All of the non-Aura enchantments put onto the battlefield with Estrid's third ability enter at the same time. If any have triggered abilities that trigger on something else entering the battlefield, they'll see each other. Aura cards returned with Estrid's third ability may enchant non-Aura enchantments put onto the battlefield with that ability. You choose what each returning Aura will enchant just before that Aura enters the battlefield. The chosen recipient must be able to legally be enchanted by the Aura. This doesn't target the player or permanent it will enchant, so an opponent's permanent with hexproof may be chosen this way. If an Aura card can't enchant anything, it remains in your graveyard. 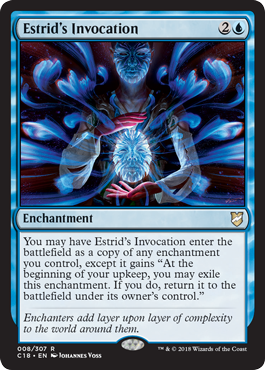 If Estrid's Invocation doesn't copy an enchantment as it enters the battlefield, it won't have the ability to exile it at the beginning of your upkeep. You can't have it copy itself to get this ability. Once Estrid's Invocation returns, it's considered a new object with no relation to the object that it was. You must choose an enchantment that's currently on the battlefield to copy (or to not copy anything). Auras that were attached to it will be put into their owners' graveyards. Any counters that were on it cease to exist. Estrid's Invocation copies exactly what was printed on the original enchantment (unless that enchantment is copying something else or is a token; see below). It doesn't copy whether that enchantment is tapped or untapped, whether it as any counters on it or any Auras attached to it, or any non-copy effects that have changed its types, color, or so on. If the copied enchantment has X in its mana cost, X is considered to be 0. If the chosen enchantment is copying something else (for example, if the chosen enchantment is another Estrid's Invocation), then Estrid's Invocation enters the battlefield as whatever the chosen enchantment copied. If the chosen enchantment is a token, Estrid's Invocation copies the original characteristics of that token as stated by the effect that created the token. Estrid's Invocation doesn't become a token in this case. If the chosen enchantment is an Aura, you choose what it enchants just before Estrid's Invocation enters the battlefield. The chosen recipient must be able to legally be enchanted by the Aura Estrid's Invocation will be. This doesn't target the player or permanent it will enchant, so an opponent's permanent with hexproof may be chosen this way. If the chosen enchantment is an Aura but Estrid's Invocation won't be able to legally enchant anything, Estrid's Invocation remains in its current zone and doesn't enter the battlefield. 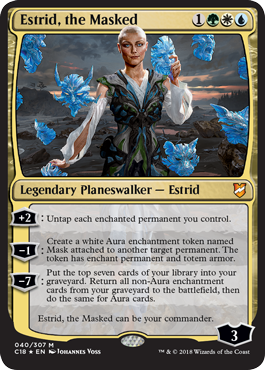 If Estrid's Invocation is on the stack, it's put into its owner's graveyard. Any enters-the-battlefield abilities of the copied enchantment will trigger when Estrid's Invocation enters the battlefield. Any "as [this enchantment] enters the battlefield" or "[this enchantment] enters the battlefield with" abilities of the chosen enchantment will also work. If Estrid's Invocation somehow enters the battlefield at the same time as another enchantment, it can't become a copy of that enchantment. You may choose only an enchantment that's already on the battlefield. You'll draw only one card for each opponent attacking you or your planeswalkers, no matter how many creatures they're attacking with. If multiple opponents are attacking you or your planeswalkers at once, you'll draw one card for each of those opponents. T: Choose target commander that entered the battlefield this turn. Put a +1/+1 counter on it if it's a creature and a loyalty counter on it if it's a planeswalker. If the target commander is somehow a creature and a planeswalker, most likely because it's Gideon, it receives both kinds of counters. 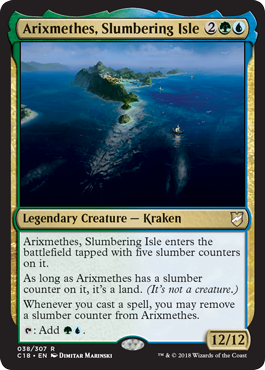 If the target commander is somehow neither a creature nor a planeswalker (such as Arixmethes, Slumbering Isle may be), it receives no counters. Fury Storm can copy any instant or sorcery spell, not just one with targets. The copy is created on the stack, so it's not "cast." Abilities that trigger when a player casts a spell won't trigger. This means, for example, that Fury Storm's copies may target Fury Storm itself, but this won't trigger the copy's "when you cast this spell" ability, and it won't increase the number of copies of other spells you end up with. If you copy a spell, you control the copy. It will resolve before the original spell does. The copy will have the same targets as the spell it's copying unless you choose new ones. You may change any number of the targets, including all of them or none of them, but not how many targets there are. If, for one of the targets, you can't choose a new legal target, then it remains unchanged (even if the current target is illegal). If the spell that's copied is modal (that is, it says "Choose one —" or the like), the copy will have the same mode. A different mode can't be chosen. If the spell that's copied has an X whose value was determined as it was cast (like Lavalanche does), the copy will have the same value of X. If the spell has damage divided as it was cast (like Chandra's Pyrohelix), the division can't be changed (although the targets receiving that damage still can). The controller of a copy can't choose to pay any alternative or additional costs for the copy. However, effects based on any alternative or additional costs that were paid for the original spell are copied as though those same costs were paid for the copy. If you choose not to put the nonland permanent card you reveal onto the battlefield, you'll put it on the bottom of your library with the other cards. If your library no longer has any nonland permanent cards, you'll reveal your library and then put it back in a random order. Each copy resolves one at a time. Any abilities that trigger on the permanent entering the battlefield resolve before the next copy resolves. The original spell is the last to resolve. 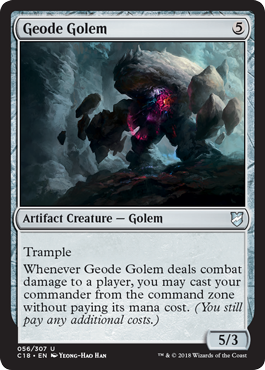 If you wish to cast your commander without paying its mana cost, you must cast it while the triggered ability of Geode Golem is resolving. You can't cast for free it later in the turn. It may be cast at a time you normally wouldn't be able to cast a creature spell, but other restrictions (such as "Cast this card only from your graveyard") are enforced. If you cast a card "without paying its mana cost," you can't choose to cast it for any alternative costs, such as bestow costs. You can, however, pay additional costs. If the card has any mandatory additional costs, such as the commander tax, those must be paid to cast the card. Geode Golem's triggered ability triggers even if your commander isn't in the command zone at the time Geode Golem deals combat damage to a player. If your commander finds its way there before the trigger resolves, you can cast it. Geode Golem's triggered ability triggers even if it's dealt lethal damage at the same time it deals combat damage to a player. 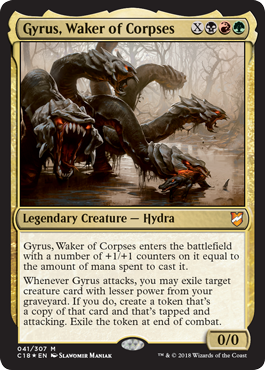 Gyrus, Waker of Corpses enters the battlefield with a number of +1/+1 counters on it equal to the amount of mana spent to cast it. The amount of mana you spent to cast Gyrus is usually equal to its converted mana cost, normally 3 plus the value chosen for X. However, you also include any additional costs you pay, including the commander tax. If Gyrus enters the battlefield without being cast, then no mana was spent to cast it. It enters the battlefield without any +1/+1 counters. If no other effects are increasing its toughness at that time, it will be put into its owner's graveyard as a state-based action. 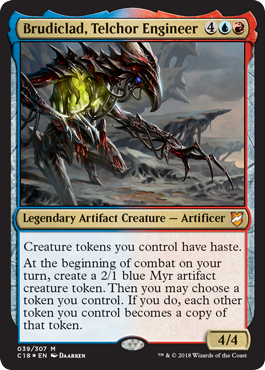 If another creature enters the battlefield as a copy of Gyrus, consider how much mana was spent to cast that creature to determine how many +1/+1 counters it enters with. Gyrus's token copies exactly what was printed on the original creature card and nothing else. It doesn't copy any effects that modified it before it was put into your graveyard. If the copied creature card has X in its mana cost, X is considered to be 0. Any enters-the-battlefield abilities of the copied creature card will trigger when the token enters the battlefield. Any "as [this creature card] enters the battlefield" or "[this creature card] enters the battlefield with" abilities of the chosen creature card will also work. You choose which player or planeswalker the token is attacking. It doesn't have to be attacking the same player or planeswalker that Gyrus is attacking. Although the token is attacking, it was never declared as an attacking creature (for the purposes of abilities that trigger whenever a creature attacks, for example). You don't move any Auras or Equipment until Heavenly Blademaster's triggered ability is resolving. 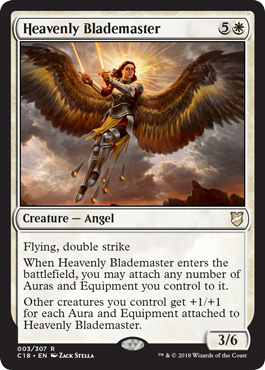 If Heavenly Blademaster is no longer on the battlefield, the Auras and Equipment you intended to attach to it remain as they were. You can't try to attach an Aura or Equipment to Heavenly Blademaster if that Aura or Equipment can't legally be attached to it. Because damage remains marked on a creature until it's removed as the turn ends, nonlethal damage dealt to a creature you control may become lethal if Heavenly Blademaster leaves the battlefield during that turn or if an Aura or Equipment is removed from it. 2, T: Scry 1, then you may reveal the top card of your library. If a basic land card is revealed this way, put it onto the battlefield tapped. Activate this ability only if an opponent controls at least two more lands than you. You can activate Isolated Watchtower's ability if you control more lands than an opponent, as long as at least one opponent also controls two or more lands than you. If multiple enchanted or enchantment creatures you control attack, you draw that many cards. If an enchanted enchantment creature attacks, you draw only one card for it. The phrase "you control" applies to both "enchanted creature" and "enchantment creature." That is, Kestia's ability triggers when an enchanted creature you control attacks, not any player's enchanted creature. +2: Discard a card, then draw a card. If a land card is discarded this way, draw an additional card. −3: Return up to two target land cards from your graveyard to the battlefield. 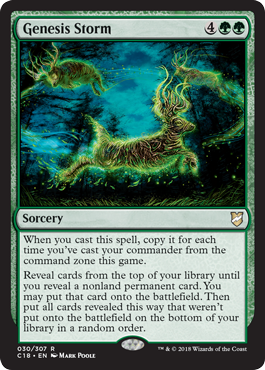 −11: Destroy up to six target nonland permanents, then create six 2/2 green Cat Warrior creature tokens with forestwalk. If you have no cards in hand as Lord Windgrace's first ability resolves, you'll discard nothing then you'll draw one card. 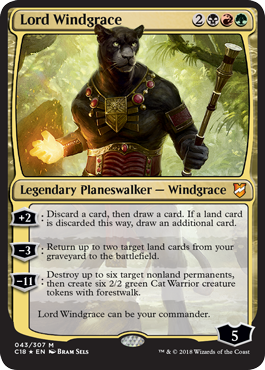 While resolving Lord Windgrace's last ability, you create six Cat Warrior tokens even if fewer than six nonland permanents are destroyed. However, if you choose any targets for the ability and each of them becomes an illegal target, the ability doesn't resolve and you don't create any tokens. Once Loyal Unicorn's lieutenant ability has resolved while you control your commander, its effects persist this turn even if you lose control of your commander or Loyal Unicorn. 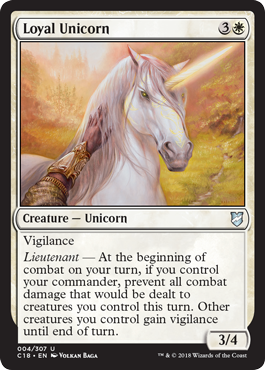 Loyal Unicorn's effect will prevent all combat damage that would be dealt to creatures you control, even if those creatures weren't on the battlefield or weren't creatures when the effect resolved. 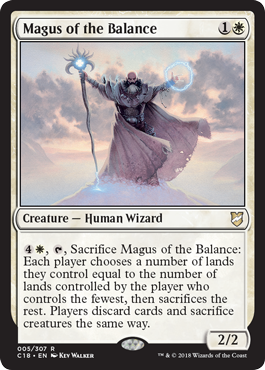 4W, T, Sacrifice Magus of the Balance: Each player chooses a number of lands they control equal to the number of lands controlled by the player who controls the fewest, then sacrifices the rest. Players discard cards and sacrifice creatures the same way. When Magus of the Balance's ability resolves, first the player whose turn it is chooses an appropriate number of lands they control (which may be zero if that player doesn't control more lands than the player who controls the fewest). Then each other player in turn order does the same, knowing choices made by previous players. Finally, all of the chosen lands are sacrificed simultaneously. Players repeat this process for cards in hand and creatures they control, except while choosing cards in hand, players won't know the identity of cards chosen by the previous players. Players can't take actions once Magus of the Balance's ability begins to resolve until it's done resolving. If any abilities trigger during this process, they're put onto the stack after it's done resolving. If a player has zero cards in hand, controls no lands, or controls no creatures, other players will have to discard their entire hand, sacrifice all of their lands, or sacrifice all of their creatures, as appropriate. 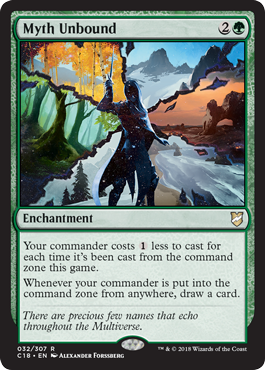 Your commander costs 1 less to cast for each time it's been cast from the command zone this game. Myth Unbound's cost reduction applies after you apply the commander tax. In effect, this reduces the commander tax to 1. 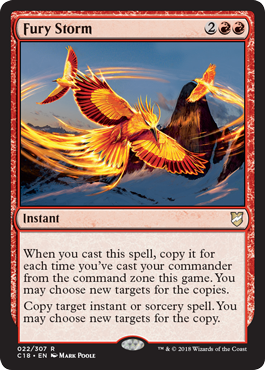 Myth Unbound's cost reduction applies even if you're casting your commander from a zone other than the command zone. 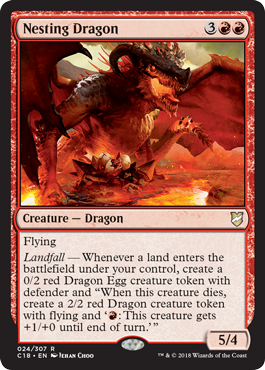 Landfall — Whenever a land enters the battlefield under your control, create a 0/2 red Dragon Egg creature token with defender and "When this creature dies, create a 2/2 red Dragon creature token with flying and 'R: This creature gets +1/+0 until end of turn.'" Because Nesting Dragon's landfall ability doesn't assign a name to the tokens, the tokens are named by their given creature types: "Dragon Egg." This means that the creatures have the same name as the creature card Dragon Egg, although the tokens have no mana cost and their converted mana cost is 0. Constellation — Whenever Nylea's Colossus or another enchantment enters the battlefield under your control, double target creature's power and toughness until end of turn. If an effect instructs you to "double" a creature's power, that creature gets +X/+0, where X is its power as that effect begins to apply. Toughness is doubled similarly. If a creature's power is less than 0 when it's doubled, instead that creature gets -X/-0, where X is how much less than 0 its power is. For example, if an effect has given Nylea's Colossus -8/-0 so that it's a -2/6 creature, doubling its power and toughness gives it -2/+6, and it will become a -4/12 until end of turn. Octopus Umbra overwrites all previous effects that set the creature's base power and toughness to specific values. 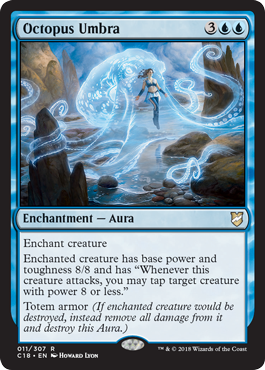 Any power- or toughness-setting effects that start to apply to a creature after Octopus Umbra becomes attached to it will overwrite this effect. Any power- or toughness-modifying effects (those that give +N/+N, for example) and counters will apply to the creature's new base power and toughness, even if they started to apply before Octopus Umbra became attached. Activating Primordial Mist's last ability doesn't trigger abilities that trigger "when [something] is turned face up." If you activate Primordial Mist's last ability but don't play the exiled card this turn, it remains exiled. You must follow the normal timing permissions and restrictions of each card you play. You may play a land exiled this way only if you have an available land play this turn. You'll still pay all costs for a spell cast this way, including additional costs. You may also pay alternative costs such as evoke costs. If you somehow control a face-down token, you may exile it to activate Primordial Mist's last ability, but you won't be able to cast that token. A token creature can die just like a nontoken creature before ceasing to exist. Ravenous Slime can replace this by exiling the token. The exiled creature's last known existence on the battlefield is checked to determine its power. 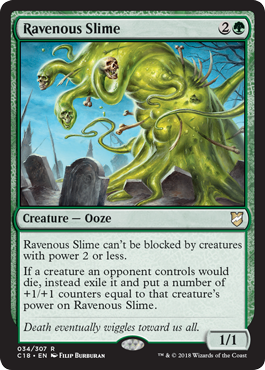 If Ravenous Slime dies at the same time as an opponent's creatures, the opponent's creatures are exiled. If more than one replacement effect tries to change where a dying creature ends up, that creature's controller chooses which effect applies. For example, if two players control a Ravenous Slime, a creature controlled by a third player will be exiled by the Ravenous Slime of that third player's choice, and the other Ravenous Slime won't get +1/+1 counters. 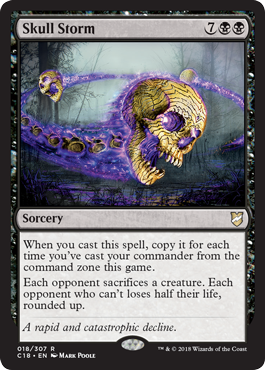 If an opponent's commander would die, that player may choose to save it and move it to the command zone before Ravenous Slime gets a taste of it, or that player may choose for Ravenous Slime to exile their commander and then save their commander from exile and move it to the command zone. Ravenous Slime receives +1/+1 counters only in the latter case. The target permanent's last known existence on the battlefield is checked to determine its types. Reality Scramble can target any permanent you own, including those another player controls. A token's owner is the player who created it. You'll stop as soon as you reveal a card that shares any card types with the target permanent. 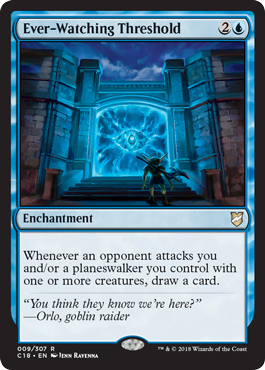 For example, if the target permanent is an artifact creature, you'll stop as soon as you reveal a card that's an artifact or a creature. In most cases, at least one card in your library (the card you put on the bottom of your library) will share a card type with the target permanent. 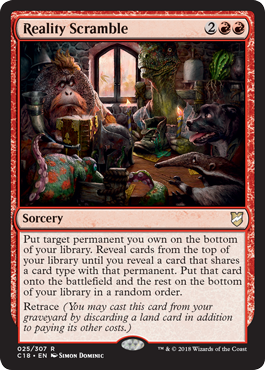 However, in some unusual situations, no cards in your library share a card type with the permanent (perhaps because the permanent was a token or its types were changed). In that case, you'll reveal your entire library, put nothing onto the battlefield, and put the cards back in a random order. +1: The next spell you cast this turn costs 1 less to cast for each artifact you control as you cast it. To determine the total cost of a spell, start with the mana cost or alternative cost you're paying, add any cost increases, then apply any cost reductions (such as that of Saheeli's second ability). The converted mana cost of the spell remains unchanged, no matter what the total cost to cast it was. The total cost to cast a spell is locked in before you pay that cost. 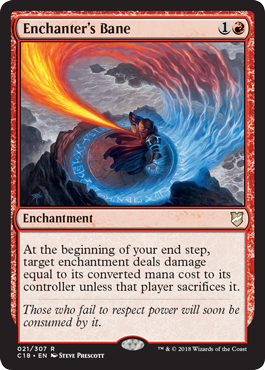 For example, if you control three artifacts, including one you can sacrifice to add C to your mana pool, Saheeli's second ability will reduce the cost of a spell you cast by 3. Then you can sacrifice the artifact when you activate mana abilities just before paying the cost, and it remains reduced by 3. Saheeli's second ability reduces only generic mana in the cost of the next spell you cast. 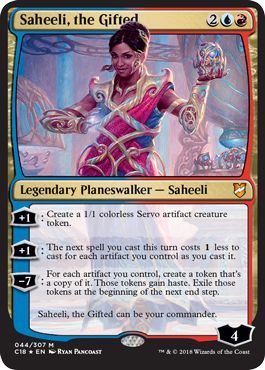 While resolving Saheeli's third ability, each token copies exactly what was printed on the original artifact and nothing else (unless that artifact is copying something else or is a token; see below). It doesn't copy whether that artifact is tapped or untapped, whether it has any counters on it or Auras attached to it, or any non-copy effects that have changed its types, color, or so on. If a copied artifact has X in its mana cost, X is considered to be 0. If a copied artifact is a token, the token that's created copies the original characteristics of that token as stated by the effect that created the token. If a copied artifact is copying something else (for example, if the copied artifact is a Sculpting Steel), then the token enters the battlefield as whatever that artifact copied. Any enters-the-battlefield abilities of a copied artifact will trigger when the token enters the battlefield. Any "as [this artifact] enters the battlefield" or "[this artifact] enters the battlefield with" abilities of the artifact will also work. Saheeli's Directive considers the individual converted mana costs of the artifact cards you reveal. The sum of their converted mana costs may be greater than X. If a card in your library has X in its mana cost, X is considered to be 0. All of the artifacts put onto the battlefield this way enter at the same time. If any have triggered abilities that trigger on something else entering the battlefield, they'll see each other. The amount of life to lose is determined only as Skull Storm resolves. For example, if an opponent controls no creatures and has 30 life when you cast Skull Storm and make two copies, the first to resolve causes that opponent to lose 15 life (so they have 15 life left), the second causes that opponent to lose 8 life (7 life left), and the original spell causes that player to lose 4 life, leaving the player at 3 life. You must choose two different players. You can be one of those players. Sower of Discord's triggered ability causes the second player to lose life. This isn't damage and it's not caused by the source that dealt damage to the first player. If Sower of Discord is dealt lethal damage at the same time that one of the chosen players is dealt damage, its ability will cause the second player to lose life. 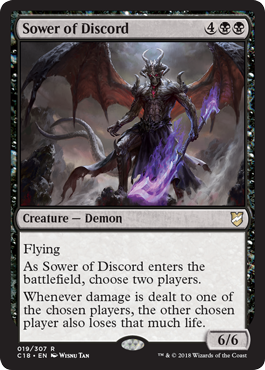 If Sower of Discord's controller is dealt damage that causes them to lose the game at the same time that either of the chosen players is dealt damage, Sower of Discord's triggered ability won't resolve and the other chosen player won't lose life. Activated abilities contain a colon. They're generally written "[Cost]: [Effect]." Some keyword abilities (such as equip) are activated abilities and will have colons in their reminder text. An activated mana ability is one that produces mana as it resolves, not one that costs mana to activate. Triggered abilities use the word "when," "whenever," or "at." They're often written as "[Trigger condition], [effect]." Some keyword abilities are triggered abilities and will have "when," "whenever," or "at the beginning of" in their reminder text. Tawnos's ability targets an ability that is on the stack and creates another instance of that ability on the stack. It doesn't cause any object to gain an ability. An "artifact source" is a permanent, spell, or card in any zone with the card type "artifact." For example, Tawnos's ability can target a cycling ability you've activated if the discarded card is an artifact card. The source of the copy is the same as the source of the original ability. If the ability is modal (that is, if it says, "Choose one —" or similar), the mode is copied and can't be changed. If the ability divides damage or distributes counters among a number of targets (for example, the ability of Verdurous Gearhulk), the division and number of targets can't be changed. If you choose new targets, you must choose the same number of targets. If the activated ability's cost contains a choice, such as a creature to sacrifice or a number of counters to remove, the copy uses that same information. You can't pay the cost again, even if you want to. Any choices made when the ability resolves won't have been made yet when it's copied. Any such choices will be made separately when the copy resolves. If a triggered ability asks you to pay a cost (such as that of Mirrorworks), you pay that cost for the copy separately. If an ability is linked to a second ability, copies of that ability are also linked to that second ability. If the second ability refers to "the exiled card," it refers to all cards exiled by the ability and the copy. For example, if Tidehollow Sculler's enters-the-battlefield ability is copied and two cards are exiled, they both return when Tidehollow Sculler leaves the battlefield. In some cases involving linked abilities, an ability requires information about "the exiled card." When this happens, the ability gets multiple answers. If these answers are being used to determine the value of a variable, the sum is used. For example, if Soul Foundry's enters-the-battlefield ability is copied, two cards are exiled. The value of X in the activation cost of Soul Foundry's other ability is the sum of the two cards' converted mana costs. As the ability resolves, you create a token copy of each card. If a creature can't attack for any reason (such as being tapped or having come under that player's control that turn), then it doesn't attack. If there's a cost associated with having it attack, the player isn't forced to pay that cost, so it doesn't have to attack in that case either. Each creature's controller still chooses which player or planeswalker the creature attacks. 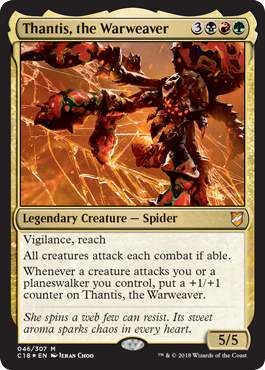 You can't attack yourself or your own planeswalkers to give Thantis +1/+1 counters, but Thantis appreciates the way you think. Whenever an opponent taps an artifact for mana, gain control of that artifact until the end of your next turn. An artifact is "tapped for mana" when a player activates a mana ability of an artifact that includes T (the tap symbol). Notably, tapping an artifact to pay for a spell with the improvise keyword is not tapping that artifact for mana. If the artifact leaves the battlefield, Treasure Nabber doesn't nab it from the zone it moved to. The artifact remains tapped when you gain control of it. If an opponent taps an artifact for mana during your turn, you'll gain control of it and keep control of it until the end of your next turn. If you control multiple Treasure Nabbers, their effects all expire at the same time. You won't keep an artifact for any longer. 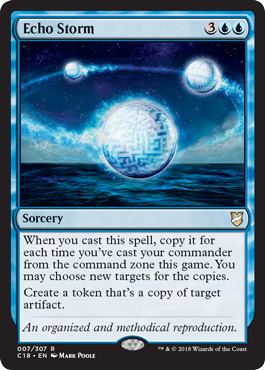 If multiple players each control Treasure Nabbers, an artifact tapped for mana will make quite a journey. 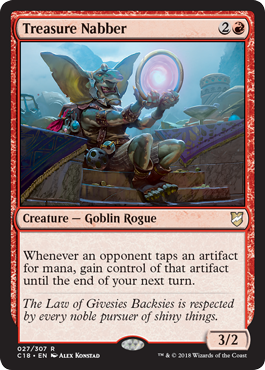 For example, if player A taps an artifact for mana during their turn, and players B and C are the next players in turn order who control Treasure Nabbers, C's ability resolves before B and C gains control of the artifact. Then B gains control of the artifact. B keeps it during their turn, and then C regains control of the artifact once B's effect expires, then A will have it back after C's expires. However, if B or C taps the artifact for mana, one of them will take it from the other. You may need to pay very careful attention to which effects are still in effect, which have expired, and who owns what. In a multiplayer game, if a player leaves the game, all cards that player owns leave as well. If that player controls any nabbed treasures, the effect giving that player control of those artifacts ends. G, Sacrifice three creatures: Return target land card from your graveyard to your hand. 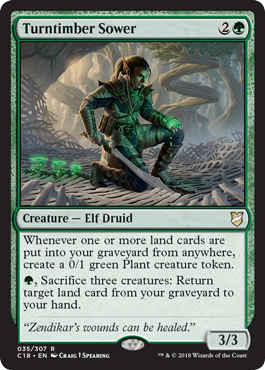 If multiple land cards are put into your graveyard at once, Turntimber Sower's first ability triggers only once. This could happen because an effect put them there from your library at once, or because they were destroyed at the same time (such as two land creatures that were dealt lethal combat damage), for example. Tuvasa's triggered ability resolves before the spell that caused it to trigger. It resolves even if that spell is countered. 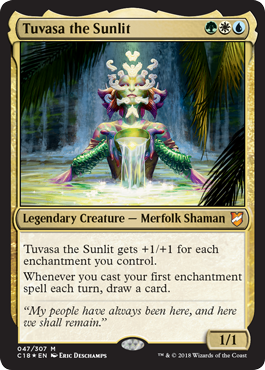 Because damage remains marked on a creature until it's removed as the turn ends, nonlethal damage dealt to Tuvasa may become lethal if some of your enchantments leave the battlefield during that turn. The player who creates the Survivor tokens owns them, not Varchild's controller. Varchild's second ability isn't locked in as Survivor tokens are created. For example, if a player gains control of Varchild, that player's Survivor tokens may attack Varchild's former controller. Survivor is a creature type. Varchild's second ability affects any creatures your opponents control that happen to be Survivors, not just the Survivor tokens it creates. Similarly, its third ability affects all creatures that happen to be Survivors. A creature that's all creature types is a Survivor. 2, Exile two cards from your graveyard: Create a tapped 2/2 black Zombie creature token. Varina's first ability counts the number of Zombies you attacked with, even if some of those Zombies leave combat before the triggered ability resolves. The number of cards you discard and the amount of life you gain are both equal to the number of Zombies you attack with, even if you draw a different number of cards somehow. 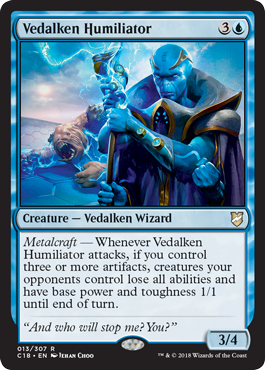 Metalcraft — Whenever Vedalken Humiliator attacks, if you control three or more artifacts, creatures your opponents control lose all abilities and have base power and toughness 1/1 until end of turn. All creatures your opponents control are affected by Vedalken Humiliator's ability, not just those controlled by the player it's attacking. Vedalken Humiliator's ability overwrites all previous effects that set an affected creature's base power and toughness to specific values. Any power- or toughness-setting effects that start to apply to a creature after the ability resolves will overwrite this effect. Any power- or toughness-modifying effects (those that give +N/+N, for example) and counters will apply to the creature's new base power and toughness, even if they started to apply before Vedalken Humiliator's ability resolved. If you don't control three artifacts as Vedalken Humiliator's ability resolves, it has no effect. If you do, the effect continues to apply even if you lose control of Vedalken Humiliator or your artifacts later in the turn. Vedalken Humiliator's ability affects only creatures your opponents control at the time it resolves. Creatures they begin to control later in the turn won't lose power, toughness, or abilities. A creature with indestructible or a creature that regenerates won't count as having been "destroyed this way." 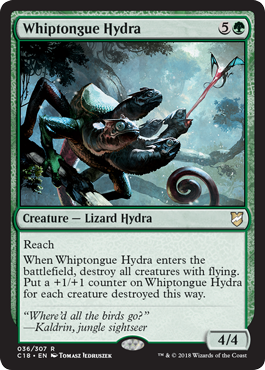 If a creature with flying would be destroyed, but an Aura with the totem armor ability is destroyed instead, Whiptongue Hydra won't count that creature or that Aura as a "creature destroyed this way." 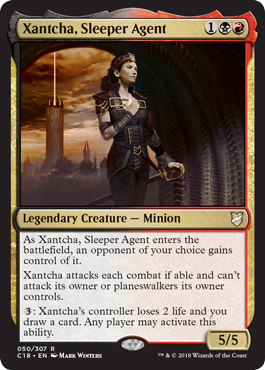 Xantcha's first ability is a replacement effect that modifies how it enters the battlefield, not a triggered ability. Players can't take actions (such as activating its last ability) while Xantcha's on the battlefield before it's controlled by another player. If Xantcha can't attack for any reason (such as being tapped or having come under that player's control that turn), then it doesn't attack. If there's a cost associated with having it attack, the player isn't forced to pay that cost, so it doesn't have to attack in that case either. The player who draws a card when Xantcha's last ability resolves is the player who activated the ability. Xantcha's controller may activate its last ability. In this case, the same player loses 2 life and draws a card. If a player creates a token that's a copy of Xantcha, the player who creates the token is its owner, not the player under whose control it enters the battlefield. This is a change from previous rules. In a multiplayer game, if a player leaves the game, all cards that player owns leave as well. If the player under whose control Xantcha entered the battlefield leaves the game, the effect changing control of Xantcha ends. Whenever Yennett, Cryptic Sovereign attacks, reveal the top card of your library. If that card's converted mana cost is odd, you may cast it without paying its mana cost. Otherwise, draw a card. 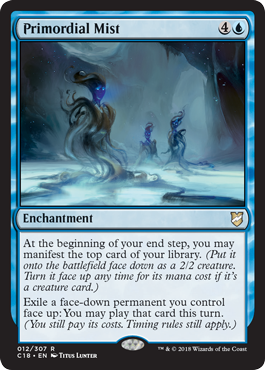 If the revealed card doesn't have an odd converted mana cost or if that card does but you choose not to cast it, you draw a card. Keep in mind that revealing a card doesn't cause it to change zones. This means that the card you draw will be the card you revealed. If you cast a card "without paying its mana cost," you can't choose to cast it for any alternative costs, such as evoke costs. You can, however, pay additional costs. If the card has any mandatory additional costs, such as that of Tormenting Voice, those must be paid to cast it. If a spell has X in its mana cost, you must choose 0 as the value of X if you cast it without paying its mana cost. 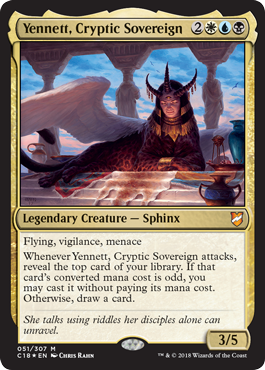 If you wish to cast the revealed card without paying its mana cost, you must cast it while Yennett's triggered ability is resolving; you can't cast for free it later in the turn. Because all attackers are chosen at once, a spell cast this way can't affect which creatures you can attack with, but it can affect which creatures will be able to block. Commander ninjutsu is a variant of ninjutsu that can be activated from the command zone as well as from your hand. 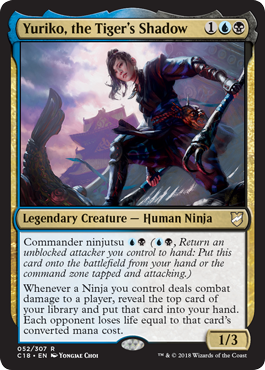 Just as with regular ninjutsu, the Ninja enters attacking the player or planeswalker that the returned creature was attacking. Although the ninjutsu ability has the creature enter the battlefield attacking, it was never declared as an attacking creature (for the purposes of abilities that trigger whenever a creature attacks, for example). Activating Yuriko's commander ninjutsu ability isn't the same as casting Yuriko as a spell. You won't have to pay the commander tax to activate that ability, and activating that ability won't increase the commander tax to pay later. Magic: The Gathering, Magic: The Gathering—Commander, Magic, Battlebond, Theros, Lorwyn, Aether Revolt, Fate Reforged, Avacyn Restored, Eventide, and Rise of the Eldrazi are trademarks of Wizards of the Coast LLC in the USA and other countries. ©2018 Wizards.